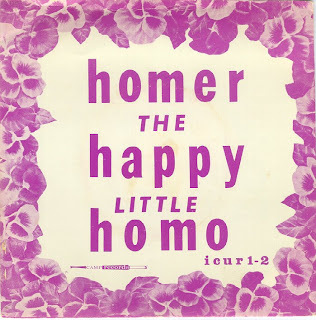 "A daring, madcap romp right from the pansy patch," went the advertising blurb for the oddity I share with you today, Byrd E Bath's Homer the Happy Little Homo. I wonder what a certain yellow skinned Homer would make of it? With tap dance solo by Rodney Dangerfield (no, not THAT Rodney Dangerfield), this peculiar disc comes from the Camp Records stable, a company which put out a dozen 45s and two full-length albums in the mid 60s available almost exclusively through a certain type of men's publication and marketed variously as out-and-out comedy records or as novelties for the underground gay market. This was during the dark years before the Stonewall riots and gay liberation, you understand, and gay men and women were still persecuted and even imprisoned for their sexuality. There's so little known about the company, the artists involved or the writers of these songs, but for sound clips to more recordings from the Camp closet, plus much more detail on the history of the company, check out the page on the Queer Music Heritage site. I love it, as I love many of the other recordings Camp issued. But it is rubbish, hence its inclusion here. It's almost impossible to find, although the albums - the Queen Is In The Closet and Mad About The Boy - do turn up on eBay occasionally: I've managed to track copies of both down but have yet to win an auction for any of the 45s.